Happy Monday! So, I guess everyone on the planet watched the Super Bowl last night, right? What a game! It was my husband’s birthday this past weekend so we celebrated in New York City with our boys and got home just in time to watch the big game. 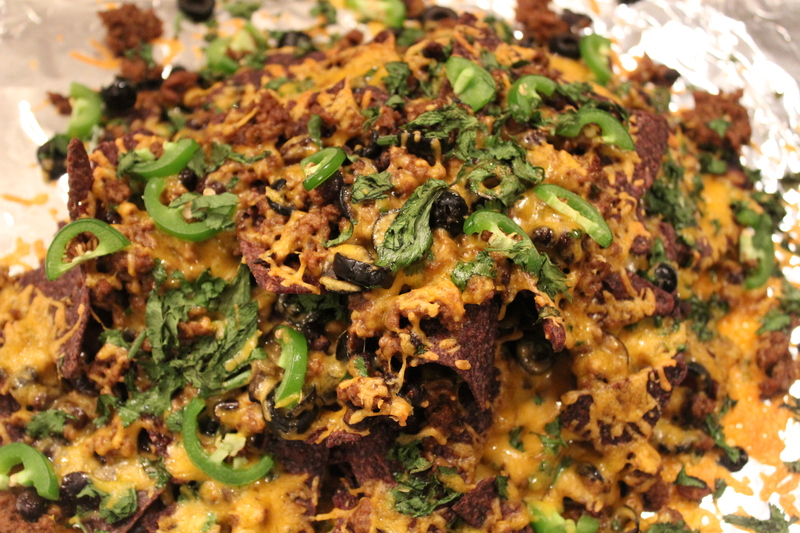 We snuggled up on the couch with Lacey and a platter of Super Nachos! 1-Arrange a mixture of corn chips on a very large platter or use your broiler pan as a platter. 2-Combine salsa ingredients in a bowl and set aside for flavors to meld. 3-In a skillet heat oil, garlic, onion and peppers to the pan and saute for 2 minutes. 4-Add meat and spices and cook for 5 minutes until meat is cooked. 5-Stir in black beans to the meat mixture and simmer. 6-In a medium sauce pan melt butter and add flour. Cook flour and butter for about 2 minutes then whisk in milk. When milk comes to a bubble stir in cheese with a wooden spoon. Remove cheese sauce from the heat. 7-Pour cheese sauce evenly over the massive spread of chips and top with beef, beans and the pico de gallo. Serve immediately. Garnish with your choice of extra toppings. Enjoy! Our version is very much the same except instead of making our own pico de gallo, we buy pre-made salsa from the grocery store. We arrange our chips in a pan and add layers of the beef and bean mixture and sprinkle shredded cheddar cheese in between the layers. We add fresh cilantro, jalapeño peppers, sliced olives and more cheese on top. Then we pop them in the oven at 350 for about 10 minutes to melt the cheese. Then we top it off with sour cream and salsa. Delicious!! Really there is no wrong way to make nachos. Our version is less work and less dishes to clean! I also like to line the broiler pan in foil for an even quicker clean up.